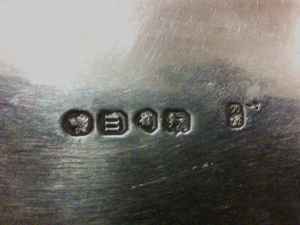 Hallmarking is the oldest form of guarantee of authenticity believed to exist. In England the first hallmarking occured in the 14th Century on silver articles to prove that they were at least 92.5% pure silver on order of King Edward I. 92.5% was considered to be pure silver but now it is known as sterling silver. 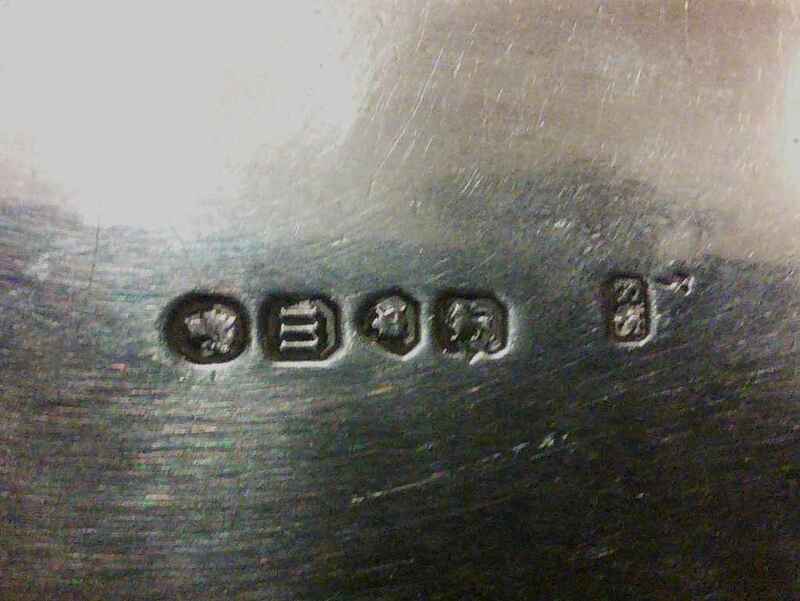 Hallmarking is split into several different marks. There are marks that indicate the maker, the assay office that carried out the testing, purity marks of the metal being tested and others specific to regions and countries. 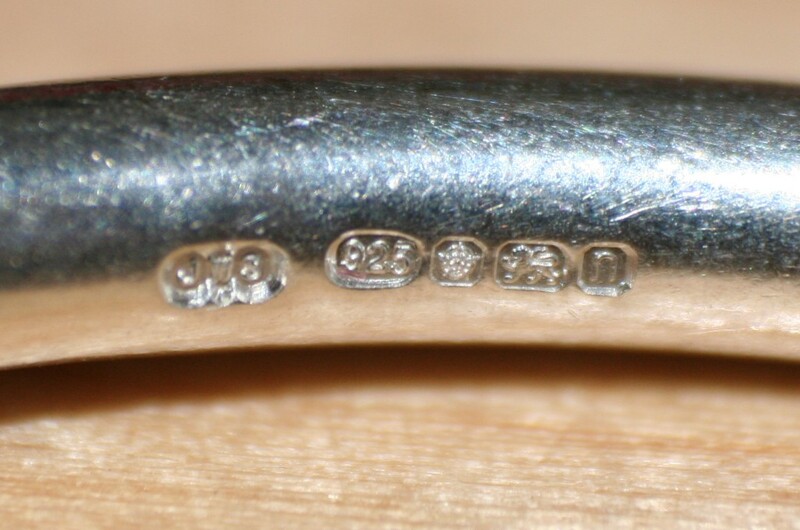 A quick breakdown of the hallmark in this picture shows the makers mark (which is actually my mark), 925 indicates the article is sterling silver, next is the Sheffield Rose which is the mark for the Sheffield Assay Office. Next is the lion which is another mark which shows the article is sterling silver and finally we have a date letter stamp for the year 2012. Any shop selling precious metal jewellery in the UK has to display a notice such as this prominently in its store. 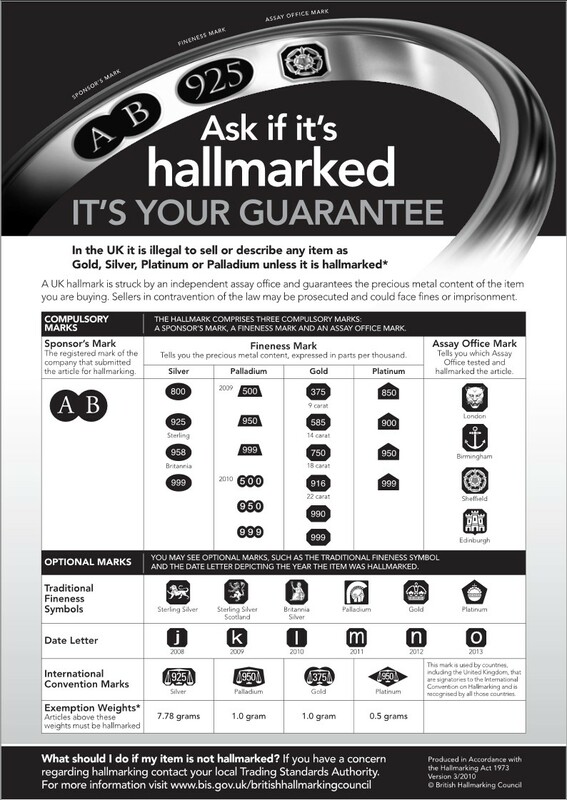 This is a regulation of the British Hallmarking Council and it is to help consumers understand what hallmarking is about. 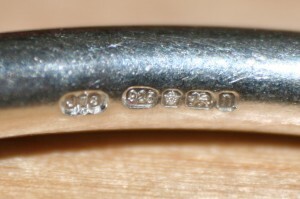 The notice shows the different types of mark that can appear on UK hallmarked jewellery. The 4 assay offices in the UK have their own mark. London uses a leopard`s head, Sheffield is a rose, Birmingham uses an anchor and Edinburgh uses a castle. All metal marks are exactly the same in each of the assay offices. Not all jewellery has to be marked and this comes down to the weight of the object. Silver for instance under 7.78 grams doesn`t have to be marked in any way but a jewellery designer can choose to hallmark it anyway if they wish to prove to customers that they are getting the real deal. Unfortunately there are companies which state their jewellery is something like sterling silver but really it is only plated. These items are almost always from outside of the European Union as most european countries have quite strict rules on the use of precious metal. If someone is thinking of making precious metal jewellery to sell in the UK it is more than likely that they need to register with one of the Assay offices. My own personal experience of this involved printing a form found on the Sheffield Assay office website. As part of the registration I had to decide on a makers mark for myself which can be initials of an individual or even a designed logo. The Sheffield Assay office organised my makers mark to be manufactured into a punch. Along with the form, you also need to include the registration fee which was £75 + VAT when I applied. About 1 month later once the makers mark had been made I then had to pay a further £75 pound which was related to the size and complexity of the makers mark. The marks themselves are based on letter sizes and originally I wanted a makers mark I think of size J, but the assay office called me to suggest if I was making earrings then I should have a smaller sized mark which I did. I can`t comment on the other assay offices but Sheffield have been nothing but helpful. One of the other aspects of the UK assay offices that most people don`t realise is that they are non profit organisations. The fee to have jewellery hallmarked pays salaries, rent and for modern technology such as laser marking machines. Any money left over at Sheffield goes into purchasing Silver pieces of extraordinary quality or importance which is displayed in their own museum. If you are someone wanting to purchase precious metal jewellery then you can be assured that the large companies such as H Samuel and Tiffanies and Pandora are all hallmarked and legal. You can also be sure that if you purchase from small jewellery companies in the UK, those that make handmade silver and gold, as long as the items have real hallmarks and not just a 925 stamp or similar on gold that the article has been tested in one of the 4 assay offices in the UK proving it is the real metal. 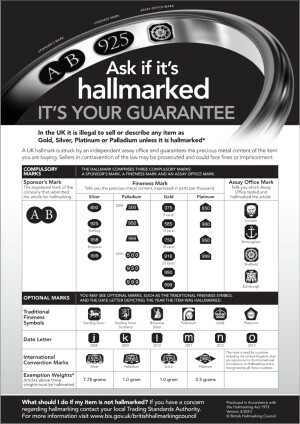 If you have any other questions about hallmarking, then the British Hallmarking Council is an excellent place to start. Assay Office London This is the first assay office created in the UK. Birmingham Assay Office created in 1773 to aid the jewellery designers in Birmingham to prosper. Edinburgh Assay Office created in 1458 for the Edinburgh goldsmiths and is Scotlands first consumer protection assurance. Sheffield Assay Office created in 1773. Sheffield had a strong history of silversmiths around this time so it was natural for Sheffield to get its own assay office.